One of my favorite childhood recipes is beans and rice. Although we usually ate red kidney beans or navy beans, I opted for the baby lima bean variety this time. But feel free to trick out this dish however you like. Maybe replace the white beans with black beans, add some browned ground meat, peppers, cumin and cilantro for a more mexican flare. The possibilities are limitless! One thing is for sure – this is a very filling and satisfying dish that is super easy and inexpensive. In fact, a quick tally of the amount of money I spent reveals roughly $6. Not a bad investment for a dish that can feed a family of four with enough food left over for another meal! Fill a large stock pot half way with water, soak beans plus 1/4 cup salt 2-3 hours. Once soaked, turn on heat to high. Once beans begin to boil, add the remaining ingredients and boil one hour. After the hour is up, remove ham hocks from the liquid, let cool, remove the ham meat from the bone, cut it in pieces and return meat to the pot. Add more water and continue boiling another hour and a half or until beans are tender. Note: Since smoked ham hocks have a tendency to vary in saltiness and flavor, do not add any more salt to your soup until the soup is done. If your soup is too salty, pour a little liquid out and add some fresh water. If it is not salty enough, add salt. Serve over a scoop of steamed white rice with fresh biscuits or cornbread. 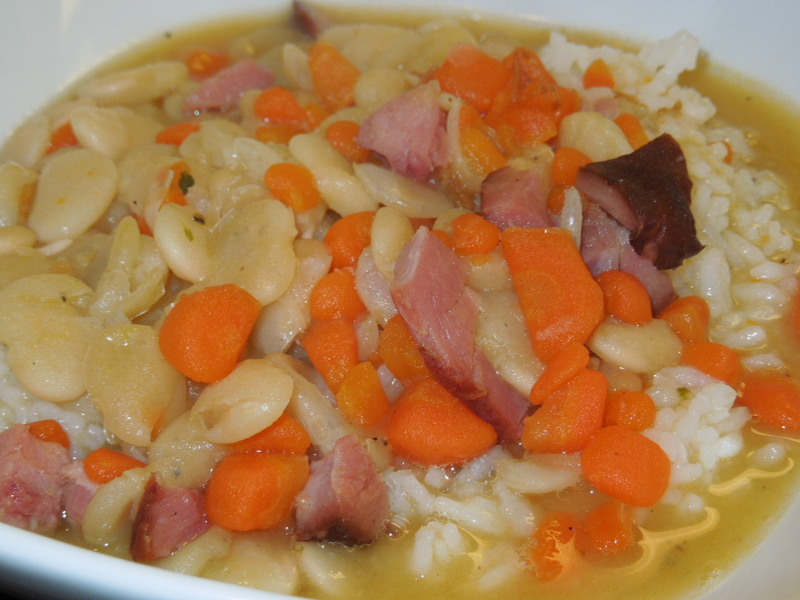 Tags: bean soup over rice, bean soup recipes, bean soup with ham hoccks, bean soup with rice, beans and rice, food, ham hocks, how to cook dried beans, how to cook dried lima beans, lima beans, recipes. Bookmark the permalink.